Hyderabad is sometimes called the “Seed Capital of India”. 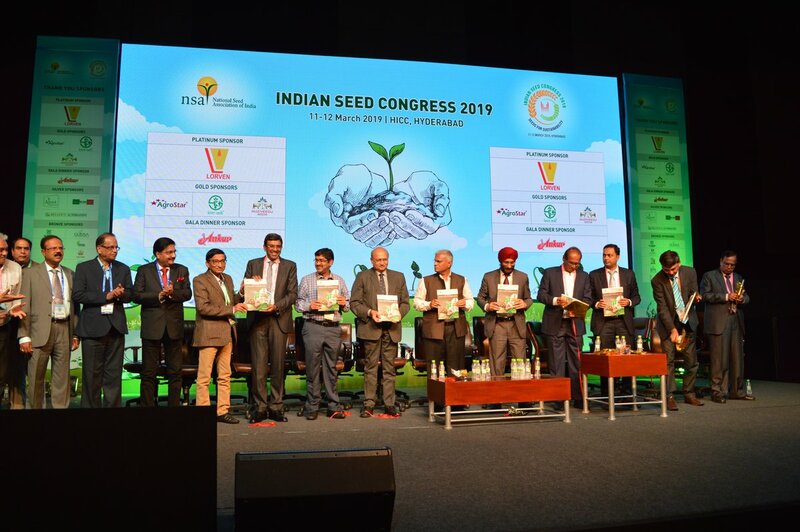 That was certainly the case in mid-March when the city hosted the India Seed Congress (ISC). The overarching topic was “Seeds for Sustainability”. Hervé Thieblemont, Ian Barker, AM Rao and Raghavender Dantapuram (from l. to r.) represented our Foundation. Also present in force were our seed sector partners such as Eagle, Motti, Sattva, Sai Bhavya and Kamadgiri. Several companies are already providing ‘our’ AAA maize* to Indian smallholders. Our team also engaged with a dozen potential new partners. This illustrates the traction that AAA maize has already gained since the pre-launch in 2018. The National Seed Association (NSA), which runs the ISC, has some 500 members. NSA General Secretary Pranjivan P. Zaveri told participants: “[Our] vision is to create a vibrant, innovative and internationally competitive research-based industry delivering high-quality seeds that benefit Indian farmers.” He also highlighted some interesting figures. India’s total seed market is currently worth about $3bn. That may sound like a lot, but actually represents only 5% of the total agricultural inputs market. As Dr. Zaveri pointed out, in developed countries, the ratio would be closer to 10-15%. With Indian farmers cultivating some 170 million hectares, the NSA sees a “massive business opportunity”. The ISC runs with technical sessions and ‘trading tables’ in parallel. This year’s exhibition had 45 booths. “Between individual meetings with our seed partners, we attended some interesting sessions”, says Hervé Thieblemont, our Regional Seed Business Development Lead. “These were on topics as varied as gene editing technology, the Fall Armyworm threat in Asia, and Public-Private-Partnerships helping to double farmers’ income”. At this latter session, Pasupuleti Janila explained how ICRISAT is pioneering partnerships for hybrid crops such as sorghum. Our Foundation is a member, and as a corporate non-profit provides a natural bridge between the public and private sectors. “As well as her interesting insights, Dr. Janila also added some welcome gender diversity to a rather male-centric session!” comments Hervé. Summing up, our Seeds2B Head Ian Barker says: “All in all, Hyderabad hosted a very dynamic, interactive and fruitful ISC. We look forward to many further activities in support of Indian smallholders.